We just got back from a week in Gatlinburg, TN. 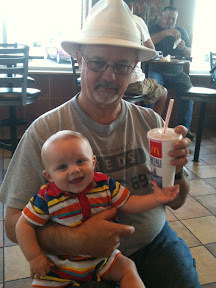 We went with my mom and dad and had a fun trip. My brother and his wife were with us until Tuesday evening. I wanted to blog some of my pictures during the week, but we were in a cabin on top of a mountain with no cell service or Internet. Tristan is the best little traveler. He only cries when he is hungry or tired. He's perfectly content to ride in the car or drag around and amusement park as long as you hold him some and play with him. On Sunday we went to the outlet mall. 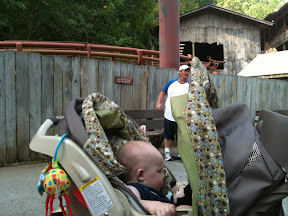 Monday was spent in Dollywood. Here's Tristan asleep at the Tennessee Tornado. We were about 10 feet from it and he didn't even flinch as it went by. 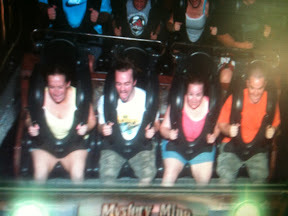 This picture is Michelle, Jared, myself and Tyler on the Mystery Mine. It has two 90 degree vertical lifts and one 90 degree drop. It was crazy! Tuesday poured the rain, but we spent the day walking around Downtown Gatlinburg. The highlight was stopping in the Old Smoky Candy Kitchen to watch people make taffy. They handed out a free piece that was warm. SO DELICIOUS! We went to dinner and then Bub and Chelle headed back to Huntington. 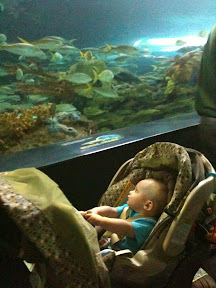 On Wednesday we went to the Ripley's Aquarium in the Smokies. It was awesome! Tristan loved it. I can't wait to take him again when he's older. On Thursday we went to The Christmas Place. It's a huge Christmas store in Pigeon Forge. We had pizza for dinner at the Smoky Mountain Brewery. It had white cheddar cheese instead of the usual mozzarella. Really good. When we got to the bottom, we fed the baby. As we waited for Tristan to finish, a black bear walked right across the path we had just walked down about one minute earlier! It came right down behind the cars and back up into the brush! 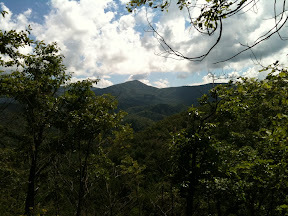 It was a great trip, but I can't help but wonder why there isn't a town like Gatlinburg in West Virginia. There's no reason one of the little mountain towns can't build up enough to draw people like Gatlinburg.